December got away from me! I know this is late, but I promise to get back on schedule and not make you wait so long for Block #9! Background fabric, cut 1 – 5 1/4″ square, and cut 6 – 3 1/8″ squares. Cut 4 of the 3 1/8″ squares in half diagonally. Accent fabric 1, cut 2 – 1 1/4″ x 5 1/4″ rectangles, 2 – 1 1/4″ x 6 3/4″ rectangles and 2 – 3 1/8″ squares. 1. Draw a diagonal line on the two 3 1/8″ background squares. Pair with two 3 1/8″ accent squares, right sides together. 2. Sew a scant ¼” on either side of the drawn line. Cut apart on the drawn line and press to the darker fabric. TIP: Square-up/trim your HSTs to 2 3/4″ square before moving onto step #3. 3. 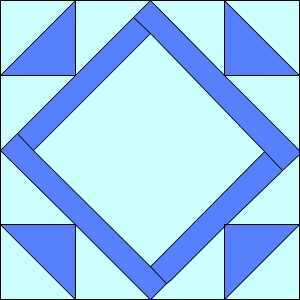 Join a 1 1/4″ x 5 1/4″ rectangle to opposite sides of the 5 1/4″ square, press seam to darker fabric. Add a 1 1/4″ x 6 3/4″ rectangle to each side, press to complete Center Unit. 4. Layout 1 HST and two background triangles as shown in Corner Unit Diagram; join and press seams open. Make 4 Corner Units. 5. Lay out Center Unit and 4 Corner Units as shown in Gem Block Diagram. 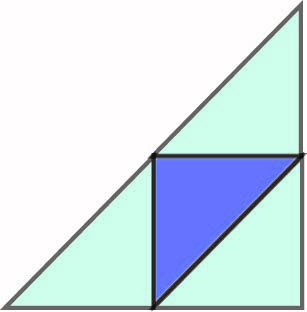 Join two opposite Corner Units to Center Unit, press. Repeat for last two sides. TIP: Pressing these 4 diagonal seams open may help your seams to lay flatter.